Check out this very nice, very EARLY 1975 Pinup, which was drawn by the great George Perez! 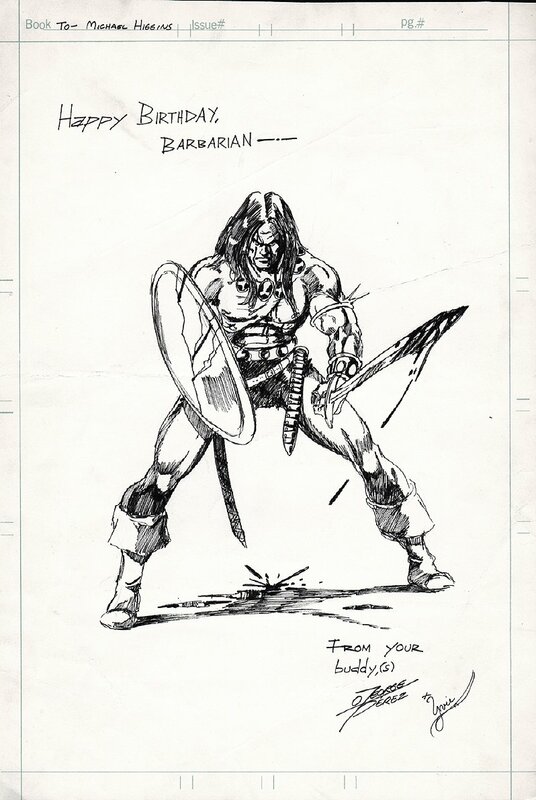 This Pinup features a nice large image of Conan with his bloodied sword, and blood all over the ground. This pinup was a personal Birthday gift from George Perez to Marvel editor Mike Higgins way back in 1975! Art is drawn on 11 by 17 inch Marvel cover stock art board from the 1970's. and is signed at the bottom! Art board does have some creases throughout and there are several useless pieces of magic tape on the back is this was probably taped ed up somewhere at the Marvel offices back in the day. Just a neat piece! ALL art on our website (including this one) are able to be purchased with VERY fair time payments, and trades are always considered towards "ANY" art on our website! Just send us an email to mikeburkey@aol.com and we can try to work something out.